Location: Parnell Building Foyer, directly opposite the Physics Museum. 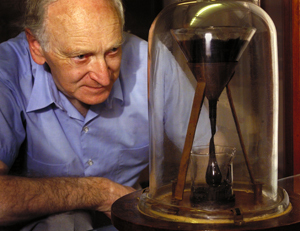 Recognised by the Guiness Book of Records as the longest running scientific experiment in the world, the Pitch Drop experiment is remembered by generations of staff and students at UQ. The first Professor of Physics at the University of Queensland, Professor Thomas Parnell, began the experiment in 1927 to illustrate that everyday materials can exhibit quite surprising properties. The experiment demonstrates the fluidity and high viscosity of pitch, a derivative of tar once used for waterproofing boats. At room temperature pitch feels solid - even brittle - and can easily be shattered with a blow from a hammer. It's quite amazing then, to see that pitch at room temperature is actually fluid! In 1927 Professor Parnell heated a sample of pitch and poured it into a glass funnel with a sealed stem. Three years were allowed for the pitch to settle, and in 1930 the sealed stem was cut. From that date on the pitch has slowly dripped out of the funnel - so slowly that now, more than 80 years later, the tenth drop is only just forming. The experiment was set up as a demonstration and is not kept under special environmental conditions (it is actually kept in a display cabinet in the foyer of the Department), so the rate of flow of the pitch varies with seasonal changes in temperature. Nonetheless, it is possible to make an estimate of the viscosity of this sample of pitch . There is a linkto a paper by Edgeworth et al below which shows that the pitch turns out to be about 100 billion times more viscous than water! The picture above is of the late Professor John Mainstone, jointly (with Parnell) awarded the Ig Nobel Prize for Physics in 2005 for his work as longtime custodian of the experiment. In the more than 80 years that the pitch has been dripping no-one has ever seen the drop fall. There is now a live video feed accessible via the website linked below so you can one of the first to do so. You can also see students of The University of Queensland milling around outside the cabinet, so it is more exciting than watching grass grow! R. Edgeworth, B.J. Dalton and T. Parnell, The Pitch Drop Experiment, Eur.J. Phys (1984) 198-200.